Cassiterite sand from Plateau State, Nigeria, Africa. Placer-mined tin is often called "stream tin." These are silt- to sand-size particles of cassiterite. Cassiterite is a tin oxide mineral with a chemical composition of SnO2. It is the most important source of tin, and most of the world’s supply of tin is obtained by mining cassiterite. Small amounts of primary cassiterite are found in igneous and metamorphic rocks throughout the world. 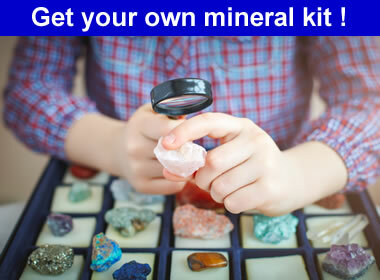 It is also a residual mineral found in soils and sediments. Cassiterite is more resistant to weathering than many other minerals, and that causes it to be concentrated in stream and shoreline sediments. Although cassiterite is the most important ore of tin, it has only been found in minable concentrations in a few locations. Streak A trace of white to no streak at all. It is often harder than the streak plate. Cassiterite has several properties that aid in its identification and enable it to be found in minable quantities. Its adamantine luster, high hardness, light streak, and high specific gravity are helpful in its identification. Its high specific gravity, resistance to weathering and physical durability enable it to survive stream transport and concentrate in placer deposits. Cassiterite from near Keystone, South Dakota. Specimen is approximately 4 inches (10 centimeters) across. Particles of cassiterite from a placer deposit near Tinton, South Dakota. Specimens are approximately 1/8 inch to 3/8 inch (0.3 centimeter to 0.95 centimeter) across. Primary deposits of cassiterite worth mining are almost always found in high-temperature hydrothermal veins that accompany granitic intrusions. There, cassiterite can be associated with tourmaline, topaz, fluorite, and apatite. Important deposits of primary cassiterite are found in Australia, Bolivia, Brazil, China, the Democratic Republic of the Congo, England, Peru, Portugal, Russia, Rwanda, Spain, and the countries of Southeast Asia. Cassiterite crystals: A cluster of cassiterite crystals from Yunnan Province, China. These crystals show the potential luster of cassiterite. Specimen and photo by Arkenstone / www.iRocks.com. Most of the world’s cassiterite is produced from secondary, placer deposits. These are sediment-hosted concentrations of cassiterite in stream valleys and along shorelines. The hardness of cassiterite enables it to survive stream transport, and its high specific gravity causes it to concentrate in deposits that are large enough and rich enough for mining. Other high-specific-gravity minerals might also occur in these deposits, improving the economy of mining. Placer deposits of cassiterite are being worked today in Burma, China, the Democratic Republic of the Congo, Indonesia, Malaysia, Nigeria, and Rwanda. The United States does not have any important domestic sources of cassiterite or other tin minerals and is dependent upon other countries. There are deposits in Alaska, South Dakota and other states, but these deposits are either small, low grade, or in locations where development will be difficult. Cassiterite gem: Cassiterite is extremely rare as a transparent, gem-quality mineral. This 9 x 11 step cushion cut gem has a rich brown color and adamantine luster. Specimen and photo by Arkenstone / www.iRocks.com. You will probably not find cassiterite in a jewelry store. Very few people have even heard the name "cassiterite." As a result there is almost no demand for it. It is also so rare that adequate amounts to support a marketing campaign are not available. As a result, cassiterite is cut mainly for collectors and museum exhibits. One property of cassiterite that can make it a spectacular gemstone is its high dispersion. Dispersion is the ability of a material to separate white light into its spectral colors. This is the property that produces the colorful "fire" of a diamond. Cassiterite has a dispersion of 0.071, which is considerably higher than diamond’s dispersion of 0.044. Cassiterite’s high dispersion enables it to produce a fire that exceeds that of diamond. Strong fire is only seen in cassiterite gems with a light color. In many stones, a dark body color partially masks the fire. Photographs of Faceted Cassiterite, a photo gallery on the website of RealGems.com, accessed September 2017.